The Calgary Roughnecks return to the Scotiabank Saddledome tonight for a Pigskin Party, presented by TELUS, against the defending NLL champion Georgia Swarm. Game time is 7:00 p.m. with $5 Rough House food and beverage specials beginning at 5:30 p.m. Calgary is on the hunt for the win column after dropping their second straight contest, a 13-8 setback in Buffalo last weekend. The victory saw the Bandits improve to .500 after building quarter leads of 5-3, 7-4 and 9-6. For Buffalo, Callum Crawford carried the offensive push with four tallies while Jordan Durston (3), Dhane Smith (2) and Kevin Brownell (2) all contributed with multi-goal efforts. Calgary sniper Curtis Dickson matched Crawford’s production, recording his first four-goal performance of the young season. Going the distance in the win for Buffalo was Alex Buque who finished the night with 44 stops. Frank Scigliano stood between the Calgary pipes for just over 55 minutes of play and turned aside 38 of the 50 shots he faced. Georgia was last in action on Jan. 6 against the undefeated Saskatchewan Rush. The 2017 Champion’s Cup series rematch saw the Rush edge the Swarm by a score of 13-9. VS. GEORGIA: Tonight marks the one and only regular season contest between the East and West Division rivals. The two clubs split the season series last year, each picking up a victory at home. For the Roughnecks, their home-turf success snapped a five-game slide. The Riggers are 9-1 in their last 10 outs against the Swarm, with the club’s lone loss a 17-8 road setback last season. Both teams finished 2017 at the top of the scoring charts. Calgary’s Curtis Dickson led the league with 54 goals and recorded a fourth-best 107 points. Swarm forward Lyle Thompson tallied a third-best (tied) 45 goals and topped all players with 116 points. Mar. 4/17 at CGY: CGY 18 GA 11 … A dominating 13-3 opening half propelled the Roughnecks to an 18-11 victory. Dane Dobbie led the way for the Riggers with an 11-point effort (7g, 4a). His seven goals and 11 points each matched career highs. The veteran forward did the majority of his damage in the initial 30 minutes, tallying eight of his points before the halftime break. Mar. 17/17 at GA: GA 17 CGY 8 … An eight-goal second quarter powered the Swarm to an 11-5 advantage after the opening 30 minutes. The home club then held Calgary to just three goals through the final half of play en route to their eighth victory of the season. Johnny Powless led the way for Georgia with three goals and seven points while Curtis Dickson (3g, 2a) and Wesley Berg (2g, 3a) both recorded a team-high five points for the visiting Roughnecks. ENTER EAST: This week marks Calgary’s second consecutive contest against an East Division rival. The Riggers are 0-2 when playing outside of their division. Calgary finished the 2017 campaign with a 4-3 record against opponents from the East. 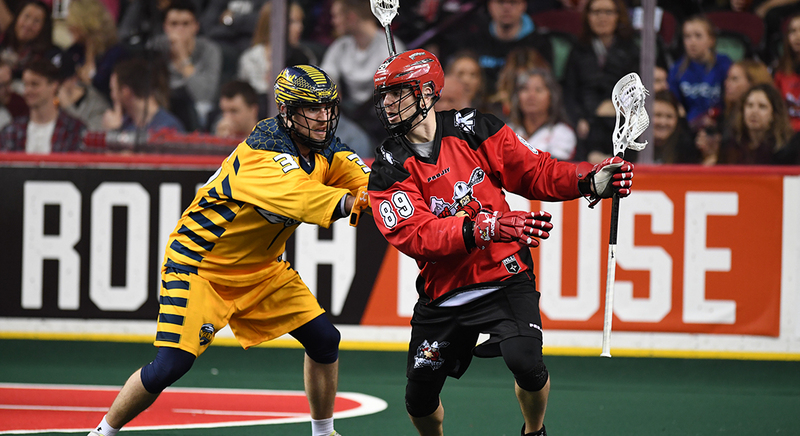 RED LIGHT REWIND: The last time the Roughnecks hosted the Swarm they scored a season-high 18 goals in an 18-11 win on Mar. 4, 2017. Calgary then duplicated that goals record three weeks later, defeating the visiting New England Black Wolves by a score of 18-13. SPECIAL TEAMS WATCH: After going 1-8 on the power play in their first two games of the season, the Roughnecks have capitalized on five of nine man-advantage chances in their last pair of contests. Of the team’s six power play goals, Dane Dobbie leads the Riggers with four (tied for second overall in the league). His single-season best is 16, set last year. The Roughnecks power play is seventh among the league at 35.3% while their penalty kill ranks fifth at 52.9%. ’NECKS NOTABLES: Alternate captain Dane Dobbie is closing in on the franchise’s all-time scoring record of 684 points, held by Jeff Shattler who spent 11 seasons with the Roughnecks from 2007-17. Dobbie has 676 points (339g, 337a) in 147 career games. ROOKIE SPOTLIGHT: Forward Ryan Martel scored his first career NLL goal in his debut appearance against Colorado at the end of the December. Drafted by Calgary 11th overall last fall, Martel spent the 2017 season with the Langley Thunder of the BCJALL. He recorded 97 points (43g, 54a) in 21 games, finishing the campaign with the second most points in league history. He capped off his Junior A season with the Marcolis Gilson Award as Rookie of the Year and was named a First Team All-Star. MILESTONE MARKERS: Three players achieved loose ball milestones last weekend against Buffalo: Mitch Wilde reached 200, Tyson Bell surpassed 200 and Creighton Reid eclipsed 500. Forward Curtis Dickson hit 400 career loose balls on Dec. 29 versus the Mammoth. Defenceman Curtis Manning eclipsed 500 career loose balls and reached 100 career caused turnovers in Calgary’s home opener on Dec. 15 against Vancouver. Goaltender Frank Scigliano suited up for game no. 100 that same night. LEADERSHIP GROUP: Defenceman/transition player Dan MacRae is wearing the ‘C’ this season. He succeeds Bruce Alexander (2002), Tracey Kelusky (2003-10), Andrew McBride (2011-15) and Mike Carnegie (2016-17) as captain. MacRae, who served as alternate captain from 2016-17, has spent his entire eight-year playing career with the Roughnecks. Defenceman Greg Harnett and forward Dane Dobbie return as alternate captains for the 2017-18 season while forward Curtis Dickson received an ‘A’ for the first time this year. Dobbie, the franchise’s all-time goals leader (339), is playing in his 11th season with Calgary. This is seven season for Harnett and for Dickson, the 2011 NLL Rookie of the Year, 2017-18 marks campaign eight with the Roughnecks. DID YOU KNOW? : This is Calgary’s 17th season in the NLL. The franchise has an all-time record of 148-120. ROUGHNECKS VS.: (BUF 0-1), (COL 0-1), (GA 0-0), (NE 0-0), (ROC 0-1), (SAS 0-0), (TOR 0-0), (VAN 1-0). ROUGHNECKS MONTH-BY-MONTH: December (1-2), January (0-1).